Speed or Direction - Which is more important? This is a question that I ask my students when giving a putting lesson. The answers are split, but most put a greater importance on the line or direction of the putt. I will point out that on a 30 foot putt that was very misaimed five feet to one side, but if they had the right distance then they would have a five foot putt left for a two putt. Even average putters rarely misaim by that much on a 30 foot putt, so their second putts would range from 1 to 3 feet, if they had the correct distance control. The best putters are on the PGA Tour and they only make 7% of their putts from 30 feet. So the premium is controlling the speed and getting the right distance and avoiding three putts. The average player rarely practices speed and distance control when they practice their putting. When teaching putting, I will ask a student to tell me in feet the distance to a hole about 30 to 40 feet in the distance. Their answers will range from five to fifteen feet short of the objective. Rarely do they get the right distance and never do they estimate the distance as longer than it actually is. One exercise, courtesy of Dr. Craig Farnsworth, I will point out a hole about 30 feet away and ask the person to visualize the distance and then have them close their eyes and walk towards the hole and stop when they think they are on top of the hole. (Try this exercise for yourself, but have a friend help you.) What Craig has observed is that most stop well short and are right or left of the target. He also found that this corresponds to their typical results on longer putts where they are also short right or left of the hole. When I ask a golf professional to estimate the distance, they give precise answers and are very close to the correct feet. When I was the teaching professional at The Broadmoor in Colorado Springs, I had the privilege to work for and play a lot of golf with Dow Finsterwald, the 1958 PGA Champion. I observed his putting practice routine before playing a round of golf. He would spend a lot of time putting to the side edges of the green and trying to stop the ball just before the edge. He explained that he wanted to get the feel of the speed of the green and establish distance control first, because that would dictate the amount of break that we would play on breaking putts. Learning this from one of the best putters ever really cemented the importance of speed control and the need to develop this attribute to becoming a better putter. To develop better distance control, practice 66% to 75% of your time on putts over 30 feet. Your concentration should be on distance first and direction second. Learn to correctly calculate the distance to a hole by estimating the length and then pacing off the distance to find the correct measurement. Do this to different holes and lengths on the putting green. Try to be as precise as possible. With a little practice you will surprise yourself with how accurate you can become. Another exercise is to walk off a hole at 30 feet and putt three balls trying not to hole the putts, but to have the ball finish on a line directly opposite to the hole. Do this drill until you consistently get two of the three balls very close to that line. Then do the same for putts of varying lengths from 15 to 60 feet. When on the golf course, get in the practice of estimating the distance in feet as part of your pre-putting routine. If you have time, always try to pace off the putt to exactly know the distance that you have to negotiate. In walking off the putt, you will also learn of any slope or up or downhill characteristics that you might not have realized from behind the ball. 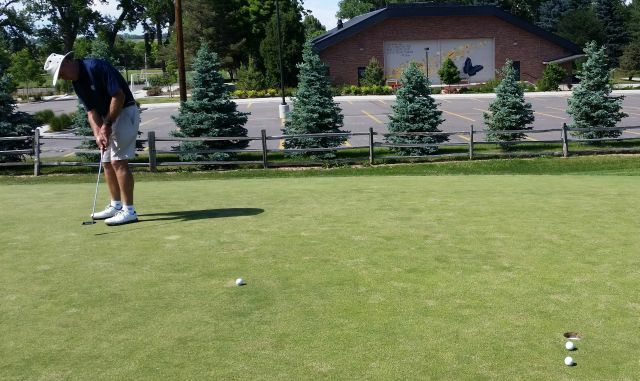 Putting is an exact science, but it relies heavily on visualization and feel. Spending some time developing your measurement calculating skills and speed control will greatly improve your putting statistics and enjoyment.